I’ll be honest: “You’ll never guess what’s in this” has never been my favorite introduction to trying a new food. There have been plenty of times that a food came with that preface and tasted wonderful, but despite the fact that I consider myself fairy adventurous in the food department, I always have to fight a moment’s hesitation when I hear those words. So, when you serve these delicious Avocado Chocolate Cookies? You might want to share what’s in them after they’ve eaten one! I know what you may be thinking…why put avocado in a chocolate cookie? It sounds pretty strange. But avocado is a great source of healthy fat, vitamins and minerals. The taste blends in very well with whatever you put it in, and it gives your recipe a creamy, smooth texture when substituted for more traditional fats (oil, butter) that you might find in baked goods. These cookies not only have avocado instead of butter, but are also sweetened with honey and use no grain! You’ll never miss it, though. They are sweet, chewy and chocolaty and they’re perfect for dessert or as an afternoon snack. This recipe comes from a brownie recipe that my sister in law gave me, which came from Danette May’s website. The brownies are excellent, and I decided to see if a cookie could be made with the same method. Begin by blending an avocado until it’s very smooth. Then, add some melted unsweetened chocolate mixed with a little coconut oil. Almond butter (peanut butter can be substituted), honey, vanilla, cage-free eggs, and a few teaspoons of almond flour go in next. Beat the mixture well, then chill it for a little while so that you can pipe the cookies out onto parchment paper (you can also drop them onto the paper after you chill the batter rather than piping them out). Pipe (or drop) the cookies onto parchment paper, then bake them. Return the unused batter to the fridge between batches, so that it doesn’t get too runny. Once the cookies are cooled, you’re ready to eat them! Be prepared to have a hard time eating just one. 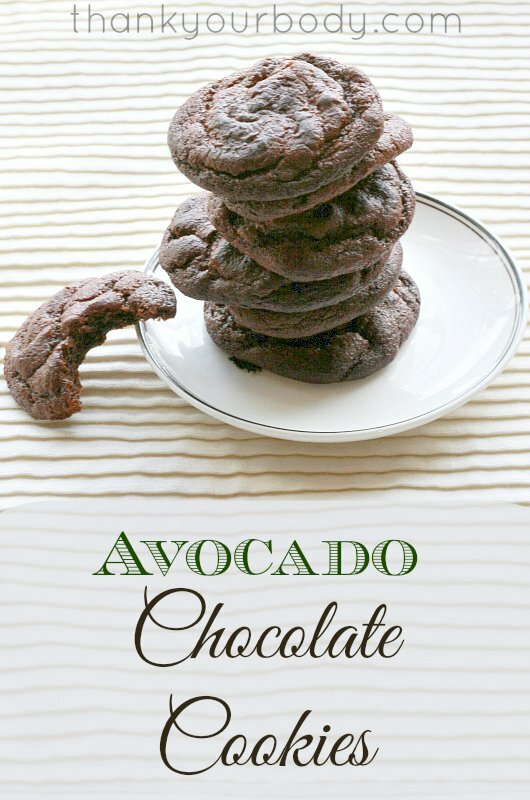 These avocado chocolate cookies may sound a bit weird - but are by far my favorite chocolate cookie out there. So moist. So easy. Super healthy. And so so SO delicious. Adapted from this recipe. In a food processor, puree the avocado until it's very smooth. Add the other other ingredients, one ingredient at a time, and pulse until the batter is combined. Chill the batter in the fridge for at least an hour. Fill a pastry bag with the chilled batter and pipe the batter out onto a cookie sheet lined with parchment paper, about a tablespoon at a time. Or, drop the chilled batter onto the paper by heaping tablespoonfuls. Bake at 350 degrees for 15-17 minutes (check after 15 minutes). Allow the cookies to cool for five minutes, then remove to a cooling rack or plate. Have you tried avocado in baked goods?